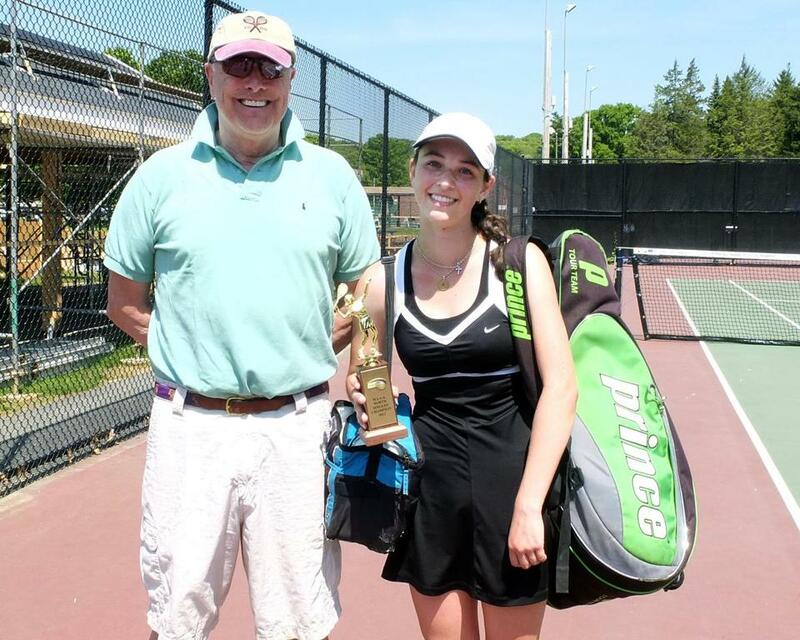 Concord-Carlisle coach Bob Furey stands with his MIAA North singles champion Julia Cancio following her two-set victory. Bamel, who paired with freshman Mei Kasif on first doubles, was named a DCL All-Star for the second consecutive season. The doubles pair finished 15-3 and advanced to the North finals of the individual tournament. Bamel will attend Tulane University. Cancio finished the season a perfect 18-0, capped with a victory over Denny LaMachia to win the North singles individual championship. The DCL All-Star and honors student also enjoys running, art, and playing the piano. Cancio also plays in USTA tournaments. Davis finished the regular season undefeated in singles play, and helped her team capture the Division 3 South title. Cohasset finished 21-3 and won the South Shore League title. Davis, an honor roll student, also plays in USTA New England and National tournaments. Fleming established an impressive four-year career, going 70-6 in singles matches. The four-time All-Scholastic will play for Pomona-Pitzer College (Calif.). Fleming, who was named Brookline's Athlete of the Year, also plays basketball and volleyball. Hoffman played first doubles with classmate Isabella Stone to go a perfect 18-0 en route to winning the North doubles title in the individual tournament. The DCL All-Star also plays USTA tournaments. Kasif, who was named a DCL All-Star as a freshman, played first doubles with Lauren Bamel and advanced to the North finals of the individual tournament. The duo finished with a 15-3 record. Kasif, who hopes to attend BU, enjoys playing the piano. King, who played first singles as a freshman and sophomore, was 18-0 her senior season at second singles. The four-time DCL All-Star reached the semifinals of the North singles tournament, and will play tennis at New York University in the fall. LaMachia made it to the North final in the state individual tournament for the first time this season. A repeat All-Scholastic, she was undefeated in the Tri-Valley League for the third straight season and was named TVL MVP. She led her team to the Division 2 EMass final. Nannery, a sophomore singles player, reached the semifinals in the South individuals tournament. With a personal record of 18-3, the Hockomock League All-Star ranks 20th in the 16-and-under New England division by the USTA. Nelson has a near-perfect record her first three seasons with the Warriors, going 40-4 in singles matches. The two-time Globe All-Scholastic and Dual County League All-Star reached the North semifinals in this year's individual tournament. Pedicini, who plays doubles with Gabrielle Riley, finished with a 16-0 record and the pair won the South championship in the individual tournament. Pedicini, who has a 3.80 GPA, also helped her team with the Division 1 South title. She hopes to play at Boston College. Prinos advanced to the South championship match in the MIAA individual tournament. She lifted her team to the Division 2 South final and an 18-0 regular season record. A repeat All-Scholastic, the senior was named the Hockomock League MVP for the third time. Riley teamed up with classmate Maggie Pedicini to go 16-0 and win the South doubles championship in the individual tournament. Riley, who also enjoys running, horseback riding, and skiing, helped Barnstable to a 16-0 record and the Division 1 South championship. In her first year with Patriots, Stone and doubles partner Hailey Hoffman assembled a perfect 18-0 record. The pair defeated Lauren Bamel and Mei Kasif of Newton South to win the North doubles title in the individual tournament. Stone also plays ice hockey. The two-time team captain played first doubles with eighth-grader Katie Tynan, and the pair advanced to the finals of the South individual tournament. Talerman, who was a Globe All-Scholastic in 2010, will play field hockey at Bentley University. Tynan played first doubles with Meghan Talerman, and the pair advanced to South finals where they lost to teammates Gabrielle Riley and Maggie Pedicini. Only an eighth-grader, Tynan also plays volleyball. In her first season as head coach, Drabkova led the Buccaneers to a 15-7 regular season record and their first state championship. "This whole season has been a complete team effort," she said. "I am very proud of the girls." Driscoll, who was named the 1995 Stonehill Football Coach of the Year, turned a team that was 1-17 five years ago into a tournament contender. The Wamps finished 13-5 this season, and made their second straight tournament appearance. Driscoll also teaches special education. Furey led the Patriots to the Division 2 state championship title after finishing the season with an undefeated record. His coaching career with the Patriots is extensive, having coached tennis for 25 years, freshmen boys soccer for 34, and cross-country and alpine skiing for 42. Atlantic Coast — Falmouth: Caroline Cobb, Gwen Koontz, Sarah Monteiro, Katie O' Sullivan. Marshfield: Erin Kane. Nauset: Emma Gubbins, Tori Paolino. Plymouth North: Amanda Strickland. Plymouth South: Jazz Hicks. Sandwich: Shannon Beloin, Brie Campbell, Jaclyn Higgins. Bay State — Brookline: Marie Fleming. Big Three — Durfee: Courtney Bailey, Grace Borden, Marlene Costa, Kaci Furtado, Sopane Khek, Jennifer Lord, Jessie Lord. Cape Ann — Ipswich: Megan Frieberger, Lexi Lopez, Hannah Lynch, Ashley Sulkin. Manchester Essex: Molly Carlson, Rachel Daley, Michelle Fuca. Masconomet: Danielle Dunn, Mia Farnham. Pentucket: Rachel Downey. Catholic Central — Archbishop Williams: Ashley Dallaire, Jessica Muscato, Patty Scott, Elaine Wang. Arlington Catholic: Stephanie Gervais, Nicole Herendeen, Becky Warner. Austin Prep: Diana Carlson, Nicole Casper, Marisa DeLuca, Marie Noga, Madison Shaw. Bishop Fenwick: Jessica Griffin, Sara Kanarkiewicz, Megan McCarthy, Demi Veloinis. Cardinal Spellman: Laura Hill, Murielle Renfort, Sammi Zina. Lowell Catholic: Melinda Mora, Katherine Rindo, Katie Smolko. Matignon: Sara Berndt, Mellissa Collins. Pope John: Iris Dunn, Kim Tran. St. Mary’s: Emily Hatchouel, Cathleen Troisi. Dual County — Acton-Boxborough: Diana Du. Bedford: Sydney Arsenault, Maya Biswas, Sarah Cowles. Concord-Carlisle: Julia Cancio, Hailey Hoffman, Madeline King, Carly McCarthy, Isabella Stone. Lincoln-Sudbury: Kaila Nelson. Newton South: Lauren Bamel, Katie Freer, Mei Kasif. Wayland: Drew Canavan, Allison Wei. Westford: Sydney Diamond. Eastern Athletic — Bishop Feehan: Rebecca Liliberte, Kathryn McCourt. Coyle & Cassidy: Kristin Carbone, Savannah Costa. Somerset Berkley: Kelsey Duff, Bojana Roman, Alison Vautrin. EIL — Beaver Country Day: Gabriela Marks. Greater Boston — Cambridge: Emma Doyle, Mei Lin Pratt. Everett: Cecellia Tran. Latin Academy: Diandrea Galloway, Mina Le, Terry Voong. Malden: Hahn Pham, Louisa Tse, Wendy Tse. Medford: Stephanie Collozzo, Bailey Lee, Michelle Nguyen. Somerville: Tenzin Loma, Kheyla Orival, Loveleen Sceini. Hockomock — Attleboro: Katherine Barlow. Canton: Erica Nannery, Erika Nannery, Michaela Nannery. Foxborough: Alana Prinos, Emma Prinos, Hallie Young. Mansfield: Emma Yeransian. North Attleborough: Jamie Grinavic, Ali McHugh, Sarabeth Parent, Amanda Rose. Sharon: Melissa Yuan. ISL — Brooks: Nicole Zohdi. BB&N: Rebecca Epstein, Isabel Goldfine. Groton: Zandra Ho, Anita Xu. Middlesex: Olivia Dewey. Milton Academy: Ilvey Bayturk, Abigail Lebovitz. St. Paul’s: Isabella Turchetta. Thayer: Olivia DiLaratti, Caroline Finnegan, Audrey Fitzpatrick. Mayflower — Bishop Connolly: Mary Cate Maher. Sacred Heart: MaryAnn Aaron. West Bridgewater: Melisa Larose. Westport: Morgan Levesque, Morgan Nicholas, Katie Rego, Zoe Shea, Emma Wilkinson. Middlesex (Large) — Belmont: Juliet Barker, Choah Kim. Lexington: Sophie Dulberg, Michelle Katzelnik, Sophie Meyers, Natalia Pronchick. Reading: Hannah Conroy, Lily Drescher, Meghan Ziegler. Winchester: Karen McKeough, Janie Weber, Sarah Wheeler. Woburn: Svetoslava Vodenicharska. Middlesex (Small) — Burlington: Nadia Eshraghi, Catherine Gianino, Molly Gilpin, Jenna Perlmutter, Eleni Pesiridis, Maya Russell, Stephanie Swiszcz. Wakefield: Meghan Chapman, Alison Doherty, Shira Faigel, Nicole Wu. NEPSAC — Boston Trinity: Semi Oloko. Brimmer & May: Maria Aguilar Moreno. Gann Academy: Marielle Marcus, Shoshana Preuss, Sarah Waxman. Landmark: Margaret Alevizos, Katie Dirico. New Mission: Joyce Guada, Jandayia Lubin, Camly Pham. Northeastern — Marblehead: Tory Booth, Lindsay Cohen, Megan Gabel, Kelly Mealey, Annie Ryan, Mary Lindsay Ryan, Megan Stanojev. Peabody: Rachel Gillis, Kayli Lehman, Alaina Warren. Revere: Devin Colon. Swampscott: Alicia Coyle, Tatum Pederson, Rita Tsokanis, Dancia Villanueva. Old Colony — Barnstable: Kristen Donnelly, Jasmine Opie, Maggie Pedicini, Lauren Persson, Gabrielle Riley, Meghan Talerman, Katie Tynan. Bridgewater-Raynham: Leah Johnson. Dartmouth: Courtlyn Long. Taunton: Emily Donaldson, Jess Khang, Chrissy Maze, Mollie Mcaffrey, Maggie McAndrews, Alisha Silva. South Coast — Martha's Vineyard: Alyssa Adler, Dylan Brockmeyer, Annie Burton, Sam Potter. South Shore — Cohasset: Emma Davis.